Convenience and quality is maximized in the Napoleon Triumph 410 with three stainless steel bottom burners and a range side burner. This propane grill also features stainless steel construction and folding side shelves for easy portability. Assembly required if delivered "Ship to Home"
Napoleon's Reversible Cast Iron Griddle is the perfect addition to your outdoor kitchen. Turn your grill into a breakfast station. Caramelize onions while you cook your burgers. Grill your favorite sandwiches, Panini style, on the reverse side of the griddle. The possibilities are endless for the Reversible Cast Iron Griddle. Season it like you would your grandmother's cast iron frying pan, the black cast iron with porcelain coating gets better every time you use it. The convenient little holes in the top allow grease to drain away from your food for the crispiest bacon, and succulent sausages. Get the Reversible Cast Iron Griddle to take your already amazing Napoleon Grill to the next level. Perfect for a multitude of different dishes, the Napoleon Flexible Grill Basket cradles food gently between two hinged sides for effortless grilling. Ideal for fish, vegetables, and perfectly grilled sandwiches, this accessory makes handling multiple, delicate foods easy. Integrated handles mean that moving, flipping, and adjusting meals on your grill is super simple. Not only does the durable stainless steel of the Napoleon Flexible Grill Basket heat evenly, but it's also easy to clean; just throw it in the dishwasher so it's ready for your next grilled creation. Meals using the Napoleon Flexible Grill Basket are only limited by your creativity. Create perfect portions with Napoleon's Eight Stainless Steel Multifunctional Skewers. These reusable skewers are made with dishwasher safe stainless steel to provide years of delicious feasts. Custom made meals are easy, slide your favorite meats and veggies onto these skewers. Cook over direct heat for perfect sear marks, or use indirect grilling for a more slow roasted and tender service. Never worry about your food sliding off and falling into the grill. The ridged ends keep whatever you skewered secure, for perfect grilling. You'll never run out of ideas for an easy meal with Napoleon's Eight Stainless Steel Multifunctional Skewers. All 304 stainless steel construction, seamless design, plenty of practical storage for full functionality, temperature memory, LED lighting and more. This true built-in design outdoor refrigerator is a premium addition to any backyard as a stand-alone fridge, built-in or as an addition to the Oasis series, providing customers with a fully functioning outdoor kitchen. Triumph 410 Propane BBQ Convenience and quality is maximized in the Napoleon Triumph 410 with three stainless steel bottom burners and a range side burner. 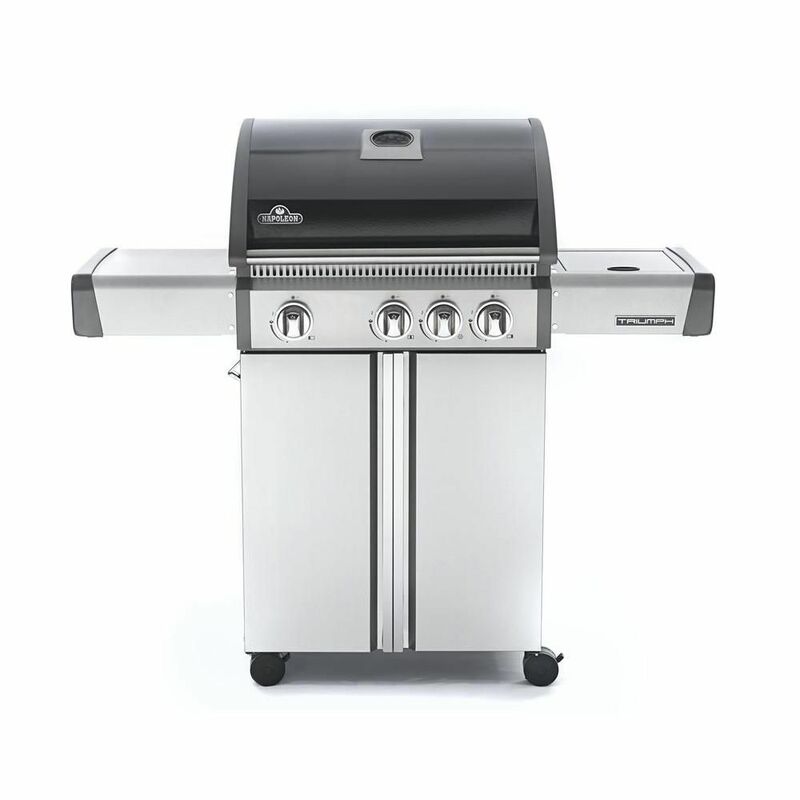 This propane grill also features stainless steel construction and folding side shelves for easy portability. Triumph 410 Propane BBQ is rated 4.6 out of 5 by 36. Rated 4 out of 5 by Pauleg from one hot bbq this bbq is super hot, I cooked a steak the other day with only 1 burner lit, my old bbq I would have to light 3 of 4 burners or it wouldn't cook anything. I'm still figueing this thing out. I'm finding it hard to cook slow its so hot, I have to trim back the fat on my steaks or I get flair ups and my steak catches on fire. The jet ignition is unreal its like lighting the burners with a tiger torch. If you can get it preassembled I would consider it because the instructions are not very clear and the bbq assembly didn't line up with the base very well. Rated 3 out of 5 by Nicholas from Delivered with certain parts damaged...very disappointing. Otherwise easy to... Delivered with certain parts damaged...very disappointing. Otherwise easy to assemble and functions well. Rated 5 out of 5 by Parkertoo from So easy to use. It works great and heats up really quickly. It took about 2 hours to put togeth... So easy to use. It works great and heats up really quickly. It took about 2 hours to put together. It was packaged very well. Rated 5 out of 5 by Steve from Grill was easy to assemble. Made of good quality... Grill was easy to assemble. Made of good quality materials. I've only used it a few times, but so far everything works great,,,the side burner is especially nice. Rated 5 out of 5 by Mikey 47 from Everything we needed in a BBQ BBQ has worked as well as we had hoped. We are using it often. Rated 4 out of 5 by DanielleH from Sleek design Just purchased this BBQ Were very pleased with it. Heats up in seconds and cooks to perfection. Rated 5 out of 5 by David from Easy to assemble and works great. Clean looking and... Easy to assemble and works great. Clean looking and am very happy with the unit. This model does not come fully assembled. Does the 550 sq inch cooking area include warming rack. Yes, the warming rack area is included in the 550 sq. inches of cooking space on the Triumph 410 grill. Is the BBQ cover included? Hello. A cover is not included with the purchase of this grill.